Ever since a little boy named Levi, who had extreme Asperger syndrome, found a way to open communication in his life after spending time in the water with Winter, at Clearwater Marine Aquarium. CMA’s CEO David Yates has worked to get the word out that CMA’s bottlenose dolphins can help people with a variety of conditions. In June, a number of children from Tampa General Hospital’s Regional Burn Unit visited with firefighters from Tampa Rescue Company 754, and hospital staff to spend some time with Nicholas, CMA’s only male resident dolphin. Nicholas suffered 2nd and 3rd-degree burns over 30% of his body before he was rescued, at six months of age, after following his mother to shore after she beached herself. “One of Tampa General’s burn care physicians even consulted with us to help Nicholas’s burns heal,” says Michael Atwell, CMA’s director of marketing and public relations. 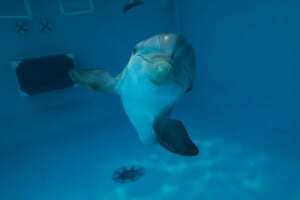 In fact, all four of the dolphins that are permanent residents of the Aquarium have conditions that keep them from ever returning to the wild. But these conditions make them especially valuable in helping humans. Of course, the facility’s most famous dolphin, Winter, lost her tail when she was trapped in a crab trap. Her recovery led to the movie, “Dolphin Tale” that has brought international renown to CMA. Winter’s best friend, Hope, is an orphan, and Panama CMA’s eldest dolphin resident is deaf. Each of the resident animals has a story that can relate to just about anyone that visits the aquarium. It all began when a small group of dedicated volunteers back in 1972 decided it was time to establish a permanent marine biology learning center in the Clearwater. Incorporated as a 501 (c)(3) nonprofit organization under the name Clearwater Marine Science Center (CMSC), those citizen volunteers began a search for a home for the old Sea-Orama, a mounted fish exhibit that had been in storage at the Clearwater Marina for several years, with hopes to be able to add live animals for visitors to observe. While they were looking for a site to build a facility, they stumbled on an abandoned water treatment plant in Clearwater adjoining Island Estates, and in 1978 the City of Clearwater agreed to give them the current facility. With two 65,000-gallon holding tanks designated for the rehabilitation of dolphins, whales and sea turtles and a great bayside location, the building proved to be a perfect fit for a marine facility’s needs. The first exhibit room, featuring fish from the original Sea-Orama, was opened to the public in 1981. As the CMSC continued to grow through individual and corporate donations, along with strong volunteer support, many sea animals were cared for in the facility. In 1984, its first Atlantic bottlenose dolphin, “Sunset Sam,” was rescued and came to the Aquarium. It suddenly became a place where people could see these beloved creatures. In the early 1990’s the organization’s name was changed to Clearwater Marine Aquarium to reflect the community’s involvement as well as the building’s ability to provide an opportunity for people to see the sea animals that are kept there and the increasing community interaction as well as educating they about the need to respect and protect marine life and the marine environment for future generations. The opening this May of CMA’s multimillion dollar new research lab and marine hospital greatly expands the Aquarium’s ability to fulfill this mission, with the help of that growing group of local residents who volunteer there. Atwell says the research lab doubles the capacity for turtle rehabilitation and provides a 250,000-gallon pool to hold up to six dolphins for research. “It’s amazing how we’ve grown,” Atwell says. 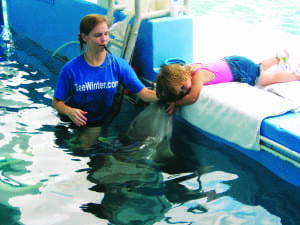 Even in the light of the national and international attention that the Clearwater Marine Aquarium has received as the result of Winter’s popularity, the mission remains the same: To preserve our marine life and environment while inspiring the human spirit through leadership in education, research, rescue, rehabilitation and release. As people became aware of all that the facility has to offer, the number of visitors skyrocketed from 76,000 in 2011 to 750,000 after the movie was released. A separate facility, located at the Harborview Center, provides an opportunity for tourists and area residents to see how the movie was made and expands the Aquarium’s ability to fulfill its mission. As the Aquarium grows, so does the need for volunteers. They are needed to help feed and care for the animals, to meet and greet the hundreds of visitors who come to the facility each day, and even to clean the animals and the kitchen. They work in different departments caring for marine mammals like otters, birds, pelicans and dolphins and in the turtle department. It’s an exciting day for those volunteers when they see one of the animals they have rescued and cared for come back to health and be able to return to their native habitat. For example, this spring a green sea turtle named Chesapeake was to be released after spending two years at CMA. “It’ll be fun to watch her go back home,” Atwell smiled. Mike Atwell says that most people don’t realize that Clearwater Marine Aquarium currently helps rescued marine creatures in six counties (soon to be seven, when Levy County joins the list). And they work closely with other agencies in 28 zones nationwide. For example, they work with Lowry Park Zoo to take advantage of the manatee rescue capability there.